With Moogfest 2017 beginning today, reports are rushing in of new synths, award recipients, performer reviews and everything in between. Today the latest invention from the legendary gear producers has been revealed, the Moog Subsequent 37 CV. Drool over the newest addition to Moog’s synth catalogue, the Subsequent CV 37 revealed today at Moogfest 2017. The new synth has been handcrafted at Moog’s headquarters in Nashville, and is limited to a worldwide run of only 2,000 units. Given the price tag of $1,799 US and its rarity, safe to say you can expect to see this bad boy popping up for a pretty penny on gear markets sometime soon. 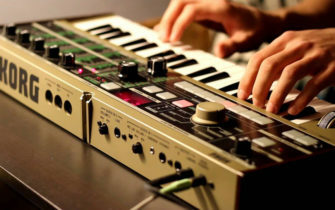 The Subsequent 37 is the result of Moog expanding on the popular Sub 37 Tribute Edition paraphonic analog synth, taking into account the wide user feedback they encountered after its release. Grab all the finer details on this monster on zZounds.